The push for universal Medicare was given new momentum by Bernie Sanders campaign for the 2016 Democratic nomination. While it is still quite far from becoming law in even an optimistic scenario, it is certainly now treated as a serious political position. This is probably best demonstrated by the fact that the Medicare for All (M4A) bill put forward by Washington representative Pramila Jayapal has 107 co-sponsors, nearly half of the Democratic caucus in the House. As much progress as M4A has made, it will still be a huge lift to get it implemented. A universal Medicare system would mean shifting somewhere around 8 percent of GDP ($1.6 trillion at 2019 levels) from the private system to a government-managed system. It would also mean reorganizing the Medicaid program and other government-run health care programs, as well as the Medicare program itself. The current system has large co-pays and many gaps in coverage, such as dental care, that most proponents of M4A would like to fill. It also has a large role for private insurers in the Medicare Advantage program, as well as the Part D prescription drug benefit. The difficulty of a transition is demonstrated by the fact that there is no agreed-upon mechanism for paying for this expansion of Medicare. Instead of a specific financing mechanism, the Jayapal bill features a menu of options. Actual legislation, of course, requires specific revenue sources, not a menu. The fact, that even the most progressive members of the House could not agree on a financing proposal that they could put their names to, shows the difficulty of the transition. This sort of age reduction approach is a reasonable incremental path, but going to age 50 or even age 60 would still be a considerable expense. There are over 60 million people in the age cohorts from 50 to 64. Including these people in Medicare at a single point would be a very serious lift. Even the more narrow group from age 60 to 64 still has almost 20 million people. That would a substantial expense. But we can make the first step even more gradual. We can just add people when they turn age 64 instead of the current 65. At first glance, this would be a bit less than 4 million people. Medicare’s payments per enrollee (net of premiums) are roughly $11,500. That would translate into $46 billion annually, roughly 1.0 percent of the total budget. But this is likely to hugely overstate the actual cost for two reasons. First, many 64-year olds will already have their insurance covered by the government. Roughly 20 percent of this age group is on Medicare as a result of being on Social Security disability. At least 10 percent more is covered by Medicaid. If we add people who are getting insurance as current or former government employees, we would almost certainly get over 40 percent already being insured through some government program, and possibly as high as 50 percent. In addition, the Medicare costs for the new group of 64-year-olds are likely to be far less than the overall average. On average, people in this age group would have health care costs of around 70 percent of the over 65 population as a whole. But the least healthy portion of the 64-year-old population is likely already covered by either Medicare, as a result of disability, or Medicaid. If we assume that the average costs for the people we are adding to the government’s tab are half of the overall average for Medicare, this gets us $5,750 per person. If we assume that we are adding 60 percent of this age group, that comes to 2.4 million people. That gives us a total tab of $13.8 billion, less than 0.3 percent of total spending, or roughly the amount the Pentagon spends in a week. It would be pretty hard to argue that this is not an affordable tab. If even that expense proves too much for the deficit hawks to handle, then maybe we can move up the age of eligibility by one month or one week. At that point, we’re talking about the cost of a few weekends for Donald Trump at Mar-a-Lago. Doing this one-year reduction in the Medicare age would be a test of how easily a reduction in the age of eligibility can be done. It should open the door to further reductions in future years. It is also likely to be popular politically. People in their late 50s and early 60s will surely appreciate the fact that they are one year closer to qualifying for Medicare. That is especially likely to the case with people who do not have good insurance through their employer and/or have serious health conditions. The proposal for a one-year reduction in the age of eligibility should also help to clarify where things stand within the Democratic caucus. Many members have argued against having the party endorse M4A. Some of this opposition undoubtedly reflects realistic political concerns that a quick switchover from the current system to M4A will not be popular in many districts. Many people are satisfied with the insurance they have now and will be reluctant to support what they will view as a big leap into the unknown. Perhaps these people can be convinced over time that a universal Medicare-type system will be at least as good for them, but they are not there now. However, some of the pushback stems from the fact that many Democrats have long depended on campaign contributions from the health care industry. While the party has not gotten as much money as the Republicans, many members do get substantial contributions, which they are not prepared to abandon. Medicare for All 64-Year-Olds should be a great way to clearly identify these people. They can’t have a principled objection to moving up the age of Medicare eligibility by one year. Nor can they plausibly claim that this is some budget-busting proposal. Congress routinely approves spending increases of this size for the military without batting an eye. If some Democrats in Congress dig in their heels and insist that Medicare for All 64-Year-Olds is something that they cannot support, it is not because they are afraid that it won’t work. It’s because they are afraid that it will. Of course, lowering the age of Medicare eligibility is not the only thing that we should be doing as part of near-term health care reform. We should look to open Medicare to the population as a whole on a voluntary basis. We should also look to make the subsidies under the Affordable Care Act more generous. And, we should be looking to bring our payments for prescription drugs, medical equipment, and doctors more in line with payments in other wealthy countries. We pay twice as much in all three areas as other wealthy countries. There is no justification for such massive overpayments in the United States. In the case of prescription drugs and medical equipment, in the short term, we should adopt the same sort of price controls as are used in other countries. In the longer term, we should be moving away from patent monopoly financing for the development of these items. We should instead do direct upfront public funding, with the idea that these products will in the future be sold as generics at free market prices (see Rigged, chapter 5 [it’s free]). But lowering the Medicare age to 64 is a really big first step. It is also a great way of clarifying the debate by letting us know which Democrats work for the health care industry. Worse, climate scientists remain silent when activists exaggerate their work, even when they materially misrepresenting it. The most extreme doomster predictions are greeted by silence. Even over-top climate doomster claims receive only mild push-back. For example, see the reactions to “The Uninhabitable Earth” by David Wallace-Wells. WaPo: “Scientists challenge magazine story about ‘uninhabitable Earth’.” Climate Feedback: “Scientists explain what New York Magazine article on “The Uninhabitable Earth” gets wrong.” It was too much even for Michael Mann. Yet leading climate scientists are quick to loudly condemn skeptics – even fellow climate scientists – for questioning aggressive claims about climate change. Allowing activists to call scientists “deniers” for challenging the current paradigm is imo among the most irresponsible actions by leaders of science, ever. By ancient law, silence means assent to activists’ behavior. They are guilty of “aiding and abetting.” For more about this, see About the corruption of climate science. But in the past few years, activist scientists’ desperation appears to have pushed them to take another step away from science. Papers to generate alarmist news! The paper is odd in several ways. It is evidence showing the broken peer-review process. Five times they describe conditions in the arctic as “unprecedented.” But they start their analysis with data from the 1970’s. Given the various kinds of long-term natural fluctuations, five decades of data is too brief a period to draw such a bold conclusion. “Arctic atmospheric variability during the industrial era (1875–2000) is assessed using spatially averaged surface air temperature (SAT) and sea level pressure (SLP) records. Air temperature and pressure display strong multidecadal variability on timescales of 50–80 yr [termed low-frequency oscillation (LFO)]. Associated with this variability, the Arctic SAT record shows two maxima: in the 1930s–40s and in recent decades, with two colder periods in between. “In contrast to the global and hemispheric temperature, the maritime Arctic temperature was higher in the late 1930s through the early 1940s than in the 1990s. … Thus, the large-amplitude multidecadal climate variability impacting the maritime Arctic may confound the detection of the true underlying climate trend over the past century. LFO-modulated trends for short records are not indicative of the long-term behavior of the Arctic climate system. Starting their analysis in the 1970s is misleading without disclosing that was a cold spell. There was concern then about global cooling (but not a consensus). See here and here for details. Starting in the 1970’s makes current conditions look extraordinary. Since we are in the warming period following the Little Ice Age, robust comparisons should include previous warm periods, such as the Medieval Warm Period and the Holocene climatic optimum. Two comments from climate scientists on this paper. — Dr. Judith Curry (bio). She her analysis of arctic sea ice trends here and here. She writes at Climate Etc. — Dr. Roger Pielke Sr. (bio). See other examples in the comments. These kind of stories are coming along like trolleys. This is a follow-up to About the corruption of climate science. Science has been politicized, distorting its results, before. It will be again. But climate science provides essential insights on several major public policy issues. Losing reliable guidance from it could have disastrous consequences. Worse, the high public profile of climate science means that a loss of public confidence in it might affect science as a whole. Let’s hope that the leaders of climate science come to their senses soon, despite their personal, institutional, and ideological reasons to continue on this dark path. Hat tip on the ERL 2019 paper to Naked Capitalism’s daily links, who uncritically run climate alarmist articles, a one-side flow of information without context – terrifying their Leftist readers (other than that, their daily links are a valuable resource – which read every morning). One of the most blatant propaganda programs is the sponsorship of free “educational” trips to Israel for all newly elected congressmen and spouses. The trips are normally led by Israel boosters in Congress like Democratic House Speaker Steny Hoyer, who recently boasted at an AIPAC gathering how he has done 15 trips to Israel and is now preparing to do another with 30 Democratic congressmen, including nearly all of those who are newly elected. The congressional trips are carefully coordinated with the Israeli government and are both organized and paid for by an affiliate of the American Israel Public Affairs Committee called the American Israel Education Foundation (AIEF). Other trips sponsored by AIEF as well as by other Jewish organizations include politicians at state and even local levels as well as journalists who write about foreign policy. As noted above, all the trips to Israel are carefully choreographed to present a polished completely Israel-slanted point of view on contentious issues. Visits to Palestinian areas are arranged selectively to avoid any contact with actual Arabs. Everyone is expected to return and sing the praises of the wonderful little democracy in the Middle East, which is of course a completely false description as Israel is a militarized ethno-theocratic kleptocracy headed by a group of corrupt right-wing fanatics who also happen to be racists. Booker inevitably reminds one of ex-President Barack Obama because he is black but the similarity goes beyond that as he is also presentable, well-spoken and slick in his policy pronouncements. One suspects that like Obama he would say one thing to get elected while doing something else afterwards, but we Americans have become accustomed to that in our presidents. More to the point, Booker was and is a complete sell-out to Israel and its Jewish supporters during his not completely successful career in New Jersey as mayor of Newark as well as in his bid for the presidential nomination. 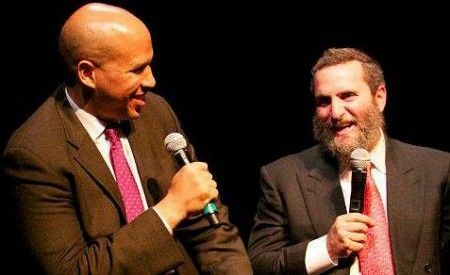 Booker is a close friend of the controversial “America’s rabbi” Shmuley Boteach and has taught himself enough Hebrew to pop out sentences from Torah with Jewish audiences. “This administration’s seeming willingness to pull away from Syria makes it more dangerous to us, makes it more dangerous to Israel, and this is not sound policy…. When you’re tweeting about pulling out of Syria within days, when that would create a vacuum that would not only endanger the United States of America but it would endanger our ally Israel as well. We need a comprehensive strategy for that region because Israel’s neighborhood is getting more dangerous than less. Syria is becoming a highway for Iran to move more precision guided missiles to Hezbollah. There has got to be a strategy in this country to support Israel that is bipartisan that is wise and that frankly calls upon all the resources of this country, not just military”. One struggles to see just a tiny bit of humanity in Booker vis-à-vis the Arabs who have lost their homes and livelihoods to Israeli criminality, but none of that comes through in a session in which, admittedly, the Senator from New Jersey is speaking with his Jewish donor/supporters. Booker is on record favoring an Israel-Palestine “two state solution,” which is no longer viable, though he has not objected to Israeli army snipers shooting dead children, journalists, medical personnel and unarmed protesters in Gaza. Frankly, we already have an American leader who puts Israel first in Donald Trump and we don’t need another round of wag the dog in our next president. Cory Booker should work hard to maintain his perfect attendance record at AIPAC as he texts “like a teenager” with Mort Fridman, but maybe someday he will actually grow up and learn to think for himself. As he is a U.S. Senator that certainly is something we might all hope for. What connects wealthy immigrants to Israel, Benjamin Netanyahu and Arnon Milchan, (Israeli operative and producer of 145 movies including 12 Years a Slave and Pretty Woman)? They are all supporters of an Israeli tax exemption that is designed to encourage Jewish billionaires to move to Israel. Since 1950, Israel’s Law of Return has offered automatic citizenship to any­one with one Jewish grandparent who resides in Israel for 90 days. Despite some tensions, immigration has overall been profitable for Israel. Ostensively to encourage immigration, during the 2008 global financial slowdown, Israel enacted Amendment 168 to its tax code exempting from both tax and reporting all foreign source income (income earned outside of Israel) of new or returning residents. By so exempting newcomers, Israel made itself into a tax haven. Despite these issues, Netanyahu attempted to increase the exemption period to 20 years in a move that would have helped Milchan but was rejected by the Finance Ministry. The Attorney General has accused Netanyahu of seeking the extension on Milchan’s behalf. Milchan‘s biography is novelistic. While running businesses in dozens of countries and producing hit Hollywood movies, Milchan secretly worked for Israel’s intelligence service, acquiring technology and weapons. His efforts included helping Israel develop its nuclear weapons by sourcing uranium from South Africa. Netanyahu and Milchan’s difficulties began in 2013, when Milchan gave an interview to the Israeli news program Uvda. In the interview Milchan detailed his secret spy work. His revelations led the U.S. to deny Milchan an extension of his ten-year residence visa, jeopardizing his Hollywood career. Netanyahu intervened on Milchan’s behalf with U.S. Secretary of State John Kerry and Milchan was granted an extension. Then, also in 2013, Milchan began expressing his gratitude by providing luxuries and cash that Netanyahu claims were just gifts from a friend. Under repeated questioning by Israel’s Attorney General Mandelblit, Milchan admitted that what Netanyahu and his wife received were not ‘gifts between friends’ but rather responses to demands made by the Netanyahus. Mandelblit has announced that after Israel’s election he intends to charge Netanyahu with taking bribes to gain influence and political favors. (The charges resulting from his relationship with Milchan are not the only charges.) Borrowing a page from his friend Donald Trump, Netanyahu has dismissed the investigation as a political witch hunt. In another echo of Trump, polls show it wouldn’t cost Likud any seats in the Knesset if he were to face charges. US-backed Ecuadorian President Lenin Moreno reneged on asylum agreements made with naturalized citizen Julian Assange, leading to his arrest on Thursday, but how exactly did relations with the whistleblower end up here? Moreno won a narrow victory in 2017 to become president of Ecuador, having served as vice president under his predecessor Rafael Correa from 2007 to 2013 as part of the center-left PAIS Alliance. Much like Assange, Moreno was nominated for the Nobel Peace Prize in 2012, for championing the rights of the disabled (he is the only world leader who uses a wheelchair). When he rose to power Moreno quickly locked horns with Assange, eventually revoking his internet access in March 2018 while also reducing the security detail at the embassy as a result of their ongoing spat. Moreno alleged that Assange had installed electronic distortion equipment in addition to blocking security cameras at the embassy. Their deteriorating relationship culminated in Moreno’s withdrawal of asylum granted to the whistleblower on April 11, 2019. “Today I announce that the discourteous and aggressive behavior of Mr Julian Assange; the hostile and threatening declarations of his allied organization against Ecuador, and especially the transgression of international treaties, have led the situation to a point where the asylum of Mr Assange is unsustainable and no longer viable,” Moreno said in a video statement shortly after Assange’s arrest. The writing had been on the wall for a long time, however. Following his 2017 election, Moreno quickly moved away from his election platform after taking office. He reversed several key pieces of legislation passed under his predecessor which targeted the wealthy and the banks. He also reversed a referendum decision on indefinite re-election while simultaneously blocking any potential for Correa to return. He effectively purged many of Correa’s appointments to key positions in Ecuador’s judiciary and National Electoral Council via the CPCCS-T council which boasts supra-constitutional powers. Moreno has also cozied up to the US, with whom Ecuador had a strained relationship under Correa. Following a visit from Vice President Mike Pence in June 2018, Ecuador bolstered its security cooperation with the US, including major arms deals, training exercises and intelligence sharing. Despite his overwhelming power and influence, however, Moreno and his family are the subject of a sweeping corruption probe in the country, as he faces down accusations of money laundering in offshore accounts and shell companies in Panama, including the INA Investment Corp, which is owned by Moreno’s brother. Damning images, purportedly hacked from Moreno’s phone, have irreparably damaged both his attempts at establishing himself as an anti-corruption champion as well as his relationship with Assange, whom he accused of coordinating the hacking efforts. Radio Free Europe noted that Pence “voiced US opposition to Turkey’s purchase of a Russian air-defense system… which he said ‘poses great danger to NATO’.” He also threatened that “we will not stand idly by while NATO allies purchase weapons from our adversaries”. The first sanctions Washington imposed against Turkey concern supply of the 100 Lockheed Martin F-35 combat aircraft ordered at a cost of 16 billion dollars. According to CNN a US spokesman said “Pending an unequivocal Turkish decision to forgo delivery of the S-400, deliveries and activities associated with the stand-up of Turkey’s F-35 operational capability have been suspended.” This is harsh action against a longtime partner and military ally, but it doesn’t stop there, because Washington objects to Russia providing military equipment to other nations. In some fashion, India is different from Turkey and China when it comes to acquiring S-400 missile systems, and an explanation of sorts was offered by the Pentagon’s Assistant Defence Secretary Randall Schriver in testimony to the House of Representatives Armed Forces Committee on March 27. He declared that the US-India “Major Defence Partnership” was prospering by “moving toward deeper security cooperation by increasing operational cooperation and availing key maritime security capabilities.” But then there was mention of the purchase for over five billon dollars by India from Russia of a world-beating air defence system, and Mr Schriver wasn’t comfortable with that. ST PAUL, Minn. – A bill moving through the Minnesota House would reform the state’s asset forfeiture laws to require a criminal conviction in most cases and close a loophole allowing state and local police to circumvent the more stringent state asset forfeiture process by passing cases off to the feds. A bipartisan coalition of representatives introduced House Bill 1971 (HF1971) on March 4. The legislation would effectively end civil asset forfeiture in the state and replace it with a criminal procedure. Under the proposed law, prosecutors would not be able to move forward with asset forfeiture proceedings without first obtaining a criminal conviction in most cases. HF1971 also addresses the policing for profit motive inherent in the current forfeiture process. Under the proposed law, forfeiture proceeds would be deposited in the state’s general fund after payment of certain expenses. Under the current law, law enforcement agencies keep up to 90 percent of forfeiture proceeds in most cases. On March 13, the Judiciary Finance and Civil Law Division Committee approved HF1971. A companion bill (SF2155) was introduced in the Senate on March 7. While some people believe the Supreme Court “ended asset forfeiture,” the recent opinion in Timbs v. Indiana ended nothing. Without further action, civil asset forfeiture remains. Additionally, as law professor Ilya Somin noted, the Court left an important issue unresolved. What exactly counts as an “excessive” in the civil forfeiture context? Going forward, opponents of civil asset forfeiture could wait and see how lower federal courts will address this “over the next few years,” or they can do what a number of states have already taken steps to do, end the practice on a state level, and opt out of the federal equitable sharing program as well. Passage of HF1971/SF2155 would take a big step toward closing a loophole that allows state and local police to get around more strict state asset forfeiture laws in a vast majority of situations. This is particularly important in light of a policy directive issued in July 2017 by then-Attorney General Jeff Sessions for the Department of Justice (DOJ). A federal program known as “Equitable Sharing” allows prosecutors to bypass more stringent state asset forfeiture laws by passing cases off to the federal government through a process known as adoption. The DOJ directive reiterates full support for the equitable sharing program, directs federal law enforcement agencies to aggressively utilize it, and sets the stage to expand it in the future. Law enforcement agencies can circumvent more strict state forfeiture laws by claiming cases are federal in nature. Under these arrangements, state officials simply hand cases over to a federal agency, participate in the case, and then receive up to 80 percent of the proceeds. However, when states merely withdraw from participation, the federal directive loses its impact. Until recently, California faced this situation. The state has some of the strongest state-level restrictions on civil asset forfeiture in the country, but state and local police were circumventing the state process by passing cases to the feds. According to a report by the Institute for Justice, Policing for Profit, California ranked as the worst offender of all states in the country between 2000 and 2013. In other words, California law enforcement was passing off a lot of cases to the feds and collecting the loot. The state closed the loophole in 2016. HF1971/SF2155 features language to close the loophole in most situations. A local, county, or state law enforcement agency shall not refer, transfer, or otherwise relinquish possession of property seized under state law to a federal agency by way of adoption of the seized property or other means by the federal agency for the purpose of the property’s forfeiture under the federal Controlled Substances Act, United States Code, title 21,section 881; or the Comprehensive Drug Abuse Prevention and Control Act of 1970, Public Law 91-513, section 413. In a case in which the aggregate net equity value of the property and currency seized has a value of $50,000 or less, excluding the value of contraband, a local, county, orstate law enforcement agency or participant in a joint task force or other multijurisdictional collaboration with the federal governmentshall transfer responsibility for the seized property to the state prosecuting authority for forfeiture under state law. If the federal government prohibits the transfer of seized property and currency to the state prosecuting authority as required by paragraph (a) and instead requires the property be transferred to the federal government for forfeiture under federal law, the agency is prohibited from accepting payment of any kind or distribution of forfeiture proceeds from the federal government. As the Tenth Amendment Center previously reported the federal government inserted itself into the asset forfeiture debate in California. The feds clearly want the policy to continue. HF1971 was referred to the House Ways and Means Committee. SF2155 was referred to the Judiciary and Public Safety Finance and Policy Committee. Seemingly overnight, the Green New Deal has arrived. Given the sorry state of our environment, what possible objections could there be? In this case, plenty – and they all trace back to the Green New Deal’s deeply complex and surreptitious ties to UN Agenda 21. Those who claim that Agenda 21 amounts to little more than a right-wing rant or is somehow anti-Semitic are at best seriously misinformed. Those who buy into the carefully crafted jargon of Sustainable Development, Smart Growth, Redevelopment and the Green New Deal are similarly misinformed and need to know that the environmental movement has in fact been highjacked by the Agenda 21 plan. Journalist Thomas L. Friedman is sometimes credited with being the original source for the term “Green New Deal” because in two 2007 articles, in the New York Times and The New York Times Magazine, Friedman connected FDR’s “New Deal” to a new “green” economy, suggesting that this might provide an economic stimulus program that could address economic inequality and climate change at the same time. Almost prophetically, Friedman also argued in earlier writings that an “iron fist inside a velvet glove” would be needed to maintain the coming new world order. The same year the Friedman articles came out the Green New Deal Group was formed. By July of 2008 this group came out with its Green New Deal Report which was originally published by the New Economics Foundation. A few months later, in October of 2008, Adam Steiner, who was Executive Director of the United Nations Development Programme (UNEP), unveiled the Global Green New Deal Initiative, the objective of which was to rescue the failing global economy by creating jobs in “green” industries, “funded” of course by the big banks. Then, following the example set by the European Greens in 2006, the United States Green Party adopted a Green New Deal platform in 2010. To its everlasting credit, the U.S. Green Party has also placed monetary reform as one of its core planks, ending the banking system’s privilege of creating the nation’s money (as credit or debt) and returning the monetary privilege to the government where it belongs, without which reform no other reforms are possible. Other political parties would do well to adopt this most important objective, since this is the true heart of “populism” historically. However, the vast bulk of the Green Party’s Green New Deal platform bears a marked (and troubling) resemblance to the Green New Deal as set out through the United Nations Agenda 21 Sustainable Development program. Most recently, a twenty-nine-year-old freshman Congresswoman from New York, Alexandria Ocasio-Cortez, has overnight managed to not only make national headlines but garner the full attention of Congress, a feat never before accomplished by one so young and so soon in office. It was her promotion of the Green New Deal that seems to have garnered her such sudden fame. But the so-called legislation she has been promoting is in reality a “draft text” that calls for a proposed addendum for House Rules: it changes the rules and creates a new process for the allocation of power, all while echoing almost verbatim United Nations Sustainable Development Goals. As a recent article in Technocracy News says, with a complete version of AOC’s “bill” included: “Its scope and mandate for legislative authority amounts to a radical grant of power to Washington over Americans’ lives, homes, businesses, travel, banking, and more.” Dr. Naomi Wolf confirms by going over the document point by point. The Green New Deal is in fact a part of a global sustainable development program that was officially rolled out at the “Earth Summit” held in Rio De Janeiro, Brazil in 1992. Out of that summit came Agenda 21 Earth Summit: The United Nations Program of Action from Rio, a 354-page document that can be purchased at online book retailers or downloaded in pdf format from the UN website. Agenda 21 has been updated to include Agenda 2030 for Sustainable Development and its offshoot the Global Green New Deal which is a program that was commissioned by the United Nations Environment Program or UNEP for short, mentioned above. A map and outline of “partners” reveals just how deeply embedded in global thinking this program has become. Effectively, Agenda 21 provides the template while Agenda 2030 gives the goals for achieving “sustainable development”. Inasmuch as Sustainable Goal 13 is about Climate Action, it is worth noting that in 2009 the United Nations Framework Convention on Climate Change (UNFCCC) set up an unelected international climate regime with authority to dictate land use, relocate “human settlements” and directly intervene in the financial, economic, health care, education, tax and environmental affairs of all nations signing the treaty. One must wonder why upwards of $100 billion has been spent on promotion of the current global warming model yet next to no discussion is devoted to natural forcing agents such as solar and cosmic radiation, volcanoes, clouds, water vapor, and grand solar minimums – even though these have been well documented in the scientific literature to have significant impact on climate. Nor have funds been committed to disseminating information about military weather warfare or other long standing geoengineering projects and their effect on climate. Yet at least five geoengineering Solar Radiation advocates co-authored the section covering contrails in the 2007 IPCC report. As uncovered by prominent activist Rosa Koire, Sustainable Development was originally created and defined by the United Nations in 1987. President George Herbert Walker Bush, along with leaders from 178 other nations, signed the “Action Plan” unveiled at Rio in 1992. This plan is anchored by the political philosophy of Communitarianism which effectively establishes a new legal system used by regional and local governments affiliated with the emerging global government, circumventing national law via a program of “balancing.” Implemented by a relatively small self-appointed group of decision-makers and influencers who achieve “consensus” among themselves rather than through the public voting process, this philosophy holds that the individual’s rights are a threat to the global community. In practice, the consistent rallying cry “for the greater good” is defined any way that suits those in power. Within six months of his election in 1992, former President Bill Clinton issued Executive Order #12852 thus creating the President’s Council on Sustainable Development or PCSD. This Council ran for six years, 1993-1999. Its members included Cabinet Secretaries for Transportation, Agriculture, Education, Commerce, Housing and Urban Development, the Environmental Protection Agency, the Small Business Administration, Energy, Interior, and Defense. CEO’s of various businesses, such as Enron, Pacific Gas & Electric, BP Amoco, Dow Chemical and others also were included, as were environmental organizations, including the National Resources Defense Council, Sierra Club, World Resources Institute, the Nature Conservancy, the Environmental Defense Fund among others. To further facilitate the transition, Clinton awarded the American Planning Association a multi-million dollar grant to write a land use legislative blueprint for every municipality in the U.S. Completed in 2002, this blueprint is entitled Growing Smart Legislative Guidebook with Model Statutes for Planning and the Management of Change. As Koire tells us, this guidebook is being used in every university, college and government planning office in the nation. And as part of the Common Core program for the younger set, former Vice President Al Gore helped write Rescue Mission Planet Earth: A Children’s Edition of Agenda 21. As Koire relates, the clear goal of these initiatives was, and is, to change public policy to bring it into alignment with the Agenda 21 plan. The irony is that UN Agenda 21 mandates ‘more’ citizen involvement but does it by creating so many boards, commissions, regional agencies, non-profits, meetings and programs that it is impossible to stay on top of what is happening. We’re too burned out to fight more than one issue at a time. So we become, necessarily, more fragmented, less of a neighborhood, exhausted and isolated because we can’t keep up. The so-called citizen involvement is dictated by phony neighborhood groups with paid lobbyists and facilitators running them. The boards and commissions are chosen based on ‘team players’ or shills selected to push through an end game by running over the few actual unconnected citizens. These groups are the ‘prescreening groups’ for candidates for public office. THEY are the ones who get donations at election time. It’s doubtful that anyone will get on the ballot who doesn’t play ball. A short article, titled “Agenda 2030 Translator: How to Read the UN’s New Sustainable Development Goals,” unveils some of the actual consequences of the Agenda. To start you off, Goal 1 as stated: End Poverty in all its forms everywhere. Goal 1 as translated: Centralized banks, IMF, World Bank, Fed to control all finances. Goal 2 as stated: End hunger, achieve food security and improved nutrition and promote sustainable agriculture. Goal 2 as translated: GMO. And so on. If you own livestock and they can drink from a creek, then they want you to permanently fence off your own land to prevent any upset of potential fish habitat… Agenda 21 focuses on the goal of eliminating meat consumption and using pastures to grow wheat, corn and soy for human consumption. To get us to comply, we’re told in endless propaganda campaigns that meat is dangerous and the vegan lifestyle is the only healthy alternative… “Grazing livestock” is listed as “unsustainable” in the UN’s Global Biodiversity Assessment Report. In the same document, agriculture and private property are listed as “unsustainable.” All the private property and water rights infringements we have been seeing come directly out of the Sustainable Development programs. They come in a wide variety of names to throw people off, such as Comprehensive Planning, Growth Management, Smart Growth, and so forth. The local government implementation of Agenda 21 was prepared by ICLEI (which stands for International Council for Local Environment Initiatives) for the Earth Council’s Rio+5 Forum held April 13–19, 1997 in Rio de Janeiro, Brazil; for the 5th Session of the UN Commission on Sustainable Development; and for the UN General Assembly’s “Earth Summit+5” Special Session. Out of this came The Local Agenda 21 Planning Guide put out by ICLEI and the United Nations. Resilient Cities are part of ICLEI. According to its website the organization was founded in 2010 by ICLEI (now known as Local Governments for Sustainability), the affiliated World Mayors Council on Climate Change and the similarly affiliated City of Bonn, Germany. Resilient Cities is billed as the first forum on cities and adaptation to climate change. In 2012 Resilient Cities was renamed as Global Forum on Urban Resilience and Adaptation. Smart Growth and Smart Cities are also part of the “sustainability” plan as evidenced by their lofty sounding goals which somehow fail to look at “new” energy or even non-industrial hemp as a soil-rebuilding, environment-friendly way to provide a sizable portion of the nation’s energy needs; which fail to understand the crucial importance of restoring carbon-rich humus to the soil via holistic livestock management and other forms of regenerative agriculture; which somehow rely on the big banks and a flotilla of “investors” rather than doing the obvious by reforming the nation’s monetary system; and which, as Koire and others correctly assert, can only lead to totalitarianism in the end. On top of all this we now find that the “tsunami” of data collection enabled by 5G could consume one fifth of global electricity by 2025. As most know, wind and solar (both of which also have significant environmental and land use problems) just won’t cut it, and especially so with 5G. Other groups and organizations tied to Agenda 21 continue to proliferate. These organizations include those that formulate “Climate Action Plans” now being adopted by local communities worldwide. The Center for Climate Solutions is one such organization and the California based Institute for local Government is another. You can google your state, city or county plus “Climate Action Plan and Resilient Plan” to learn more about how this is taking place in your own community. You can bet that none of them include alternative forms of “new” energy (including soil building non-industrial hemp) or regenerative (carbon-sequestering) agriculture which can only be properly practiced by small producers. An offshoot of the Regional Planning Association is America 2050 whose focus is on planning for the emergence of mega-regions, or high density urban areas, along with infrastructure development, with the aim of “shaping the infrastructure investment plan” and “providing leadership on a broad range of transportation, sustainability, and economic-development issues impacting America’s growth in the 21st century.” FEMA feeds into the development of megaregions through its Hazard Mitigation Program through which it, as well as HUD, provide grants to assist, at taxpayer expense, state and local communities with the purchase of properties located in high fire risk, high flood risk, high erosion risk, high mudslide risk areas. A little 40 page book titled Redevelopment: The Unknown Government put out by the California Municipal Officials for Redevelopment Reform lays out the ugly truth with charts, cartoons and hard data … Supported by powerful lobbyist groups fronting bond brokers, lawyers, and debt consultants, the trend of designating more and more redevelopment areas is also supported by government agency staff members and private businesses that profit from redevelopment. Diverting property taxes to these bloodsuckers is big business: by 2006 redevelopment agencies statewide (in California) had amassed $81 billion in bonded indebtedness, a figure that is doubling every 10 years. And don’t think that this is only in California – it’s in nearly every city and county in the United States. Because the agencies can sell bonded debt without voter approval (unlike school boards) and the city’s general fund is responsible for any over-extended debt, these are cash cows for bond brokerage firms. Other organizations tasked with promoting “sustainable development” and its corollary the “Green New Deal” include the Organization of Economic Cooperation and Development or OECD, and the World Resources Institute. The World Resource Institute recently published Creating a Sustainable Food Future which was produced “in partnership with the World Bank, UN Environment (UNEP), UN Development Programme and the French agricultural research agencies CIRAD and INRA.” On its publication announcement page, it asks whether we will be able to produce enough food sustainably to feed the estimated 10 billion people that will exist on the planet by 2015. As explained in fair detail in my book Climate Change, Land Use and Monetary Policy the answer is a resounding yes! Contrary to Agenda 21 fears, we will be able to sustainably feed, conservatively, 20 to 30 billion people worldwide if we change the way we do agriculture, which MUST include holistically managed livestock. In so doing we will dramatically reduce the amount of land now devoted to industrial agricultural systems and the amount of pollution generated by such systems – all while putting carbon back in the soil where it is needed to sustain life on this planet. The core recommendations of the 96-page report line up with many of the innovations that are already happening, sometimes at a small scale, at many Bay Area farms, food companies and tech startups. That includes the development of plant-based meat substitutes, companies and local governments that focus on reducing food waste, and farms that are making changes to reduce greenhouse gas emissions… The report calls on governments to fund research and development and to provide “flexible regulations” for new technology such as plant-based meat substitutes and innovations in plant breeding like genetic editing… Individuals should make changes to their diets, too, the authors say, especially in wealthy countries like the United States where the majority of animal-based foods are eaten … A lot of the technological advances the report urges are happening in the Bay Area. The region has become a global hub for the creation of plant-based meat substitutions, including those made by Impossible Foods of Redwood City… A new batch of companies is developing lab-grown or “cultured” meat that will be made of chicken, beef or fish tissue from cells but won’t require raising or killing animals. The 1992 Rio Earth Summit spawned a series of world summits on sustainable development sponsored by the UN. In 2012 the 20th anniversary of the Rio summit was dubbed Rio + 20. Its focus was the Green Economy with the specific purpose of ushering in global economic growth by putting market values on environmental services and environmentally-friendly production and consumption. This plan led to the term “green grabbing” which refers to the appropriation of land and resources – purportedly for environmental ends. It should, therefore, come as no surprise that, as this article in Bloomberg Online suggests, Wall Street Is More Than Willing to Fund the Green New Deal. The Rio process itself has been steadily privatized under the weight of 20 years of neoliberal globalization. As the global contradictions between economy and environment have intensified, nature itself is becoming a source of profit… What was once a state-oriented, regulatory framework has morphed into a market-based, corporate initiative. The corporate trend to privatize and commercialize ecosystem services and resources in the name of environmental protection is known as “green grabbing” as these schemes can result in local communities losing resource rights… It is the favored approach of the big conservation organizations like World Wildlife Fund (WWF), Conservation International (CI) and the International Union for the Conservation of Nature (IUCN), who have thus guaranteed their place at the Rio+20 negotiating table alongside neoliberal governments and powerful multinational business interests. The Green Economy concept that determines the content of all submissions [for the Zero draft report] was itself created by a group led by Pavan Sukhdev a former senior banker from Deutsche Bank and head of UNEP’s Green Economy Initiative. This is a reflection of a long trend in partnering between the CBD, big environmental organizations and corporate representatives i.e. the World Business Council on Sustainable Development, the International Chamber of Commerce, CI, WWF, IUCN etc. From June 1 through 5, 2005, the city of San Francisco was the site of an international conference called “World Environment Day.” But the agenda of this conference was much bigger than just another hippy dance in the park. This meeting of the global elite had a specific target and an agenda with teeth. The goal was the full implementation of the UN’s Agenda 21 policy called Sustainable Development, a ruling principle for top-down control of every aspect of our lives – from food, to health care, to community development, and beyond. This time, the target audience is our nation’s mayors. The UN’s new tactic, on full display at this conference, is to ignore federal and state governments and go straight to the roots of American society. Think globally – act locally. Here’s a quick look at a few of the 21 agenda actions called for. Under the topic of energy, action item number one calls for mayors to implement a policy to increase the use of “renewable” energy by 10% within seven years. Renewable energy includes solar and wind power. The problem that almost no one sees is that UN Agenda 21/Sustainable Development is the action plan to inventory and control all land, all water, all minerals, all plants, all animals, all construction, all means of production, all information, all energy, and all human beings in the world. Agenda 21/Sustainable Development is about Inventory and Control! Beware Agenda 21 and its Green New Deal! Geraldine Perry is the co-author of The Two Faces of Money and author of Climate Change, Land Use and Monetary Policy: The New Trifecta. U.S. Congressional leaders Nancy Pelosi (D-CA) and Chuck Schumer (D-NY) tell Israeli billionaire campaign donor Haim Saban how devoted they are to Israel. The panel is at the 2018 national convention of the Israeli American Council. Pelosi, who is Speaker of the House announces that she will name Israel partisans to chair top committees. The crowd, composed of Israeli citizens, roars its approval at the two powerful American politicians. The four-day conference was at the Diplomat Beach Resort in Hollywood, Florida. The next one is Dec. 5-8, 2019 at the same location. BUENOS AIRES, ARGENTINA – It seemed like a longshot, but anything was possible in the mind of an ambitious, 30-year-old Eduardo Elsztain. Elsztain, then living in New York, had landed a meeting with the wealthy Hungarian-American financier George Soros, a meeting that the bulk of media reports covering Elsztain’s rise to prominence claim was arranged purely by chance. Though Elsztain was inexperienced and unknown at the time, Soros saw something he liked in the ambitious Argentine, so much so that he gave him $10 million without a second thought. In recent years, Elsztain’s business empire has extended far beyond South America and into Israel, where he owns the majority stake in one of Israel’s largest conglomerates, IDB, as well as important stakes in several other notable Israeli companies. Israeli media frequently refers to Elsztain as “South America’s richest Jew.” These business interests have made him one of the most powerful oligarchs in both Argentina and the Zionist state. Yet — much like British billionaire Joe Lewis, whose activities in Argentina are described in detail in Part I of this series — a litany of crimes, schemes and conspiracies lie beneath Elsztain’s sprawling business empire and his carefully crafted image of a “self-made man” devoted to Jewish charity and religious causes. Notably, Elsztain’s massive business empire is also connected to that of Lewis through Elsztain’s longtime associate and partner Marcelo Mindlin, who co-owns Argentina’s largest private power company with Lewis. Yet, while Elsztain and Mindlin are supremely powerful and influential in their own right, they often act as the Argentine faces for policies promoted by the global oligarchy, to which they are both well connected. Indeed, Elsztain and Mindlin are connected to elite groups managed by well-known and controversial billionaire families like the Rockefellers, Rothschilds and Bronfmans, through their membership and leadership roles in groups like the Council of the Americas as well as powerful international Zionist organizations. These connections to global oligarchy and global Zionism have recently prompted Elsztain to orchestrate a policy that, if enacted, would utterly gut Argentina’s democracy and would amount to a “bloodless coup” of a country that has long been in the sights of the global elite. This article is Part II of a multi-part investigative series examining the efforts of the global elite, as well as powerful elements of the global Zionist lobby and the government of Israel, to create an independent state out of Argentina’s southern Patagonia region in order to plunder its natural resources and to fulfill long-standing Zionist interest in the territory that dates back to the “founding father” of Zionism, Theodore Herzl. Part I, which focuses on the de facto “parallel state” created by British billionaire Joe Lewis in Argentina’s Patagonia, can be read here. Part II focuses on Eduardo Elsztain — one of Argentina’s wealthiest businessmen, who is deeply connected to the global elite and global Zionist lobbies — and his role in a scheme to undercut Argentina’s democracy by hijacking its voting system. Inversones y Representaciones S.A. (IRSA), now Argentina’s largest real estate company, had humble beginnings, growing slowly after its founding in 1943 by Eduardo Elsztain’s grandfather Isaac Elsztain, a Russian-Jewish immigrant who arrived in Argentina in 1917. After his uncle’s unexpected death in 1981 and soon after Elsztain had returned from a year abroad in Israel, Elsztain took over the management of the firm, dropping out of university to do so. When Elsztain took over most of IRSA’s management, the firm was struggling and worth barely $100,000. In order to buy IRSA shares and definitively take control of the company, Elsztain turned to his friend Marcelo Mindlin, borrowing $120,000 from him to buy stock in the company. The Mindlin-Elsztain partnership would turn spectacularly lucrative and was once called “one of the most successful business marriages of menemismo,” a reference to the presidency of Carlos Menem that oversaw the privatization wave of the 1990s. However, it was not until Elsztain’s fateful meeting with Soros that IRSA was to become the behemoth it is today, now valued at $11.6 billion. Yet, there was another meeting that also helped Elsztain secure his future fortune, one that has received decidedly less coverage. While he lived in New York from 1989 to 1990, prior to meeting Soros, Elsztain made another “life changing” meeting, with the Lubavitcher Rebbe, Menachim Mendel Schneerson of the New York-based Chabad-Lubavitch movement, often simply referred to as Chabad. Chabad is arguably one of the most influential Orthodox, Hasidic Jewish organizations at the international level — the Times of Israel once called it “one of the most powerful forces in world Jewry” — and Schneerson was its most prominent and final leader. Schneerson has been touted by followers as a “prophetic visionary and pragmatic leader, synthesizing deep insight into the present needs of the Jewish people with a breadth of vision for its future,” who also “charted the course of Jewish history” in the post-World War II era. Among other things, Schneerson controversially taught that “the entire creation [of a non-Jew] exists only for the sake of the Jews” and was implacably hawkish in regards to Israel’s military occupation of Palestine. Another myth involves the claim that Soros was making a personal investment in Elsztain specifically. Instead, as a 1998 New York Times article reveals, Elsztain — during that fateful meeting — persuaded Soros to drop $10 million, not on IRSA or his own financial brilliance per se, but after convincing him “that new policies of the Argentine government intended to deregulate and privatize the economy were worth a gamble.” In fact, Soros had seen an opportunity not necessarily in Elsztain as an individual, but rather to plunder Argentina’s public resources via the coming wave of privatization. Soros — through his powerful connections to the international global elite and multinational corporations — was able to ensure that several lucrative privatizations fell into his lap. Elsztain and his partner Marcelo Mindlin as well became top beneficiaries of this crony capitalism as a result of their role as Soros’ Argentine frontmen for the duration of their decade-long partnership. By the time the partnership ended, at least publicly, in the early 2000s, Soros made at least $500 million in profits from his investments in partnership with Elsztain and Mindlin. Indeed, after just eight years of “Menemismo,” Elsztain and his associates, including his brother Alejandro and Mindlin, had become “the darlings of Wall Street’s emerging-market gurus and Argentina’s free-enterprise revolutionaries.” Elsztain and Mindlin currently continue this role as frontmen but, after outgrowing Soros in the early 2000s, became Argentine frontmen for the global elite — even after splitting up their legendary partnership, as will be described in a subsequent section of this article. After Domingo Cavallo, a Harvard-educated economist who served as president of Argentina’s Central Bank during the country’s military dictatorship, became economy minister in 1991 during Carlos Menem’s first presidential term, a wave of privatizations took place that were intended to align Argentina with the so-called “Washington Consensus” promoted by the George H.W. Bush administration. Many of those privatizations were handled by just a handful of law firms, one of which was Zang, Bergel and Viñes. As researcher and author Fabian Spollansky has noted, Zang, Bergel and Viñes was “one of the motors of the great privatization machine” and, having been hired as “consultants” by the Menem-led government, helped oversee the privatizations of key state assets, including Córdoba Waters (Aguas de Córdoba) and state oil company YPF. During many of these privatizations, two of the firm’s partners, Saúl Zang and Ernesto Viñes, were also working for IRSA — then run by the partnership formed by Elsztain, Mindlin and Soros — and Elsztain was among the firm’s top clients. The overlap generated many conflicts of interest, particularly in the privatization of the National Savings and Insurance Bank (Caja Nacional de Ahorro y Seguro), in the course of which Zang, Bergel and Viñes’ consultant contract with the government was canceled when it was revealed that the firm sought to sell the firm to Elsztain, who was also a client of the firm and employing Zang and Viñes separately through IRSA. This bank, now known as Caja S.A., was instead privatized and sold off to an Italian company and Argentina’s Werthein Group. The Wertheins are closely linked to Elsztain through their leadership roles in the international Zionist organization the World Jewish Congress, and their ties to Elsztain will be expanded upon in a forthcoming installment of this series. Starting in 1987, the World Bank began to lobby Argentina’s government, then led by Raúl Alfonsín, to either privatize or close Banco Hipotecario Nacional, or the National Mortgage Bank, which was dramatically restructured in 1992 under Menem’s presidency. The bank had traditionally been used to provide extended, low-interest loans to Argentines, particularly those of lower income, and to finance the construction of both private and public works. Despite the World Bank’s efforts, the bank’s executives and employees, along with many Argentines, strongly resisted privatization efforts. As a consequence, under the presidencies of Alfonsín and his successor Carlos Menem — whose policies, along with those of his economy minister, Domingo Cavallo, were found to have been directly responsible for the collapse of Argentina’s economy in the early 2000s — the bank underwent a “deep restructuring” that led it to dramatically reduce its staff, resulting in the closure of around 60 percent of its total branches. In addition, according to author and researcher Fabián Spollansky, the state-run bank’s coffers were manipulated for a variety of purposes that ultimately — and, as Spollansky argues, intentionally — resulted in a major crisis at the bank that led to its transformation into a wholesale bank in 1992 and to the appointment of Pablo Espartaco Rojo as its president in 1994. Espartaco Rojo had been serving as sub-secretary of deregularization and economic organization of the economy ministry, headed by Domingo Cavallo, prior to taking over control of the bank. Espartaco Rojo spent his time as the bank’s top executive paving the way for the bank’s eventual privatization in 1997, when Elsztain’s IRSA became the top shareholder in the bank, after paying $1.2 billion that came not from IRSA but from George Soros. The price to buy the bank was astoundingly low considering that the bank’s value, according to Espartaco Rojo, was much higher — and as high as $6 billion according to some. Notably, one of the consultants hired by Espartaco Rojo to aid in the bank’s privatization process was Zang, Bergel and Viñes. As president of the bank, Espartaco Rojo had sold the bank’s privatization to the country and to its Congress by asserting that he would receive, at minimum, $3 billion for the bank’s privatization, funds that would then be placed in a new Federal Fund for Regional Infrastructure that would finance the building of public works throughout the country — a promise that was never fulfilled, as only $1.2 billion was received and the fund did not build any public works. Overseeing the privatization, along with Espartaco Rojo, was then-Economy Minister Roque Fernández, a neoliberal “Chicago Boy” who was also a former World Bank and IMF official. Calls were later made to investigate Fernández and Espartaco Rojo and other parties involved in the “highly irregular” privatization of the bank, but went nowhere. One of the key people accused of involvement in illegal activities that led to the bank’s privatization is Daniel Marx, who was chief negotiator of Argentina’s external debt from 1989 to 1993 and is closely linked to the global financial elite through his investment bank, Quantum Finanzas. After the privatization, Espartaco Rojo stayed on as the bank’s president until 2000. The president of the bank after Espartaco Rojo was Miguel Kiguel who had been undersecretary of finance and chief advisor to the minister of the economy of Argentina under Menem and, most crucially, chief economist at the World Bank at the very time that the World Bank was pressuring Argentina’s government to privatize Banco Hipotecario. After the bank’s privatization, many of Elsztain’s associates were rewarded with positions on the bank’s board, including Saúl Zang and Ernesto Viñes, as well as Mario Blejer, who is the bank’s vice president. Blejer was a senior adviser to the IMF for decades, as well as a former president of Argentina’s Central Bank. As president of the Central Bank, he attempted to force the dollarization of the Argentine economy during its collapse and debt default, a crisis engineered by Menem and Cavallo’s policies. Blejer is also a long-time associate of Elsztain and a member of IRSA’s board of directors, as well as a former adviser to the Bank of England, and was considered a front-runner to head Israel’s Central Bank in both 2013 and 2018. Another notable director at the bank was Jacobo Julio Driezzen, former alternate executive director of the IMF, sub-secretary of finances at the Economy Ministry during the lead-up to Argentina’s economic collapse, and executive director of Galicia Capital Markets, a subsidiary of Banco Galicia, one of Argentina’s largest private banks. As will be shown in an upcoming article in this series, the privatization of Banco Hipotecario was just one of many “irregular” privatizations during the presidency of Carlos Menem. That article will also reveal how Menem’s policies, as well as those of his economy ministers, directly resulted in the economic crisis Argentina faced in the early 2000s, in which the global elite — including controversial figures connected to Eduardo Elsztain, Henry Kissinger, the Rockefellers, and others — sought to use this engineered crisis to pressure Argentina’s government to “swap” their debt for the entirety of Patagonia. That effort was ultimately unsuccessful. However, a similar collapse is now being engineered under the current presidency of Mauricio Macri — a close ally of Elsztain and Mindlin — with Patagonia again in the crosshairs. As was noted in Part I of this series, the global elite, and particularly powerful elements of the global Zionist lobby, have long sought to create an independent state out of Patagonia for several reasons, with the goal of dominating its rich natural resources, freshwater and oil among them. Elsztain’s acquisition of Banco Hipotecario was just one of the many moves made by him, in partnership with Soros and Mindlin, that have resulted in his multi-billion dollar net worth and the “largest business empire in Argentina.” Yet, as has been shown, none of that would have been possible without Elsztain’s connections to the elite and to Argentina’s government. However, IRSA is but a part of Elsztain’s empire, a key component of which is the agricultural commodities company, Cresud, originally founded in 1937. Elsztain began buying Cresud shares in 1992 and then purchased a majority stake in 1994, paying around $25 million for control of the company. After the purchase, Soros put nearly $62 million into the company, which then went public with Soros’ backing on the New York Stock Exchange. IRSA then became owned by Cresud, with Elsztain retaining control of both. According to a Haaretz profile on Elsztain, “It is not known whether, or to what extent, he leveraged ‏(i.e., borrowed funds at a lower rate of interest than he expected to make‏) − for the purpose of acquiring control in Cresud, in which he has a 38 percent stake.” Today, Cresud — run by Elsztain’s brother Alejandro Elsztain — is one of the country’s top producers of beef and grain and dominates Argentine agribusiness organizations. After his acquisition of Cresud — with the help of Soros and Mindlin — Elsztain “became only more aggressive in his pursuit of both urban and rural properties” after the Mexican economic crisis in 1994 and 1995, which “paid off,” according to the New York Times. As was noted in Part I of this series, that economic crisis in Mexico — the effects of which spread throughout Latin America, including Argentina — was partly due to the currency speculation conducted by another Soros associate — British billionaire Joe Lewis, who had “broken the Bank of England” with Soros just a few years prior using similar tactics — spurring the crisis from which Elsztain benefited via Cresud and IRSA. Lewis is the co-owner of Argentina’s largest private electricity company, Pampa Energía, with the other co-owner being long-time Elsztain associate Marcelo Mindlin. Cresud is believed to be one of the largest, if not the largest, landowners in Argentina, possessing an estimated 2.5 million acres, in addition to even more farmland that it leases. It has been the driving force behind the destruction of family farms in Argentina; the mass planting of GMO soybeans; and the introduction of corn-fed beef feedlots, undermining Argentina’s long-standing reputation of providing high quality, grass-fed beef. Tellingly, the New York Times praised Cresud, under Elsztain’s management, for “smashing the nation’s quaint tradition of inefficient, underfinanced family farms and ranches.” Many of Cresud’s land holdings can be found in Argentina’s Patagonia. Aside from Cresud’s and IRSA’s sizeable land holdings and business interests in Patagonia, Elsztain owns an estimated 100,000 hectares (247,000 acres) near San Carlos de Bariloche while Mindlin owns around 40,000 hectares (98,800 acres) just a few miles away from the similarly large property of Joe Lewis, whose “parallel state” in this area of Patagonia was the subject of Part I of this series. Cresud’s control over land and agribusiness extends far beyond Argentina and into other South American nations such as Brazil, Paraguay and Bolivia through BrasilAgro, in which Cresud bought a controlling stake. Cresud also holds a major stake in the Elsztain-controlled bank, Banco Hipotecario, as well as another massive Argentine real estate company, APSA. The spectacular growth of Elsztain’s business empire led the New York Times to write that his “fortunes are increasingly intertwined with the fortunes of [the] nation.” At the time, Soros held “about one-quarter of the shares of both companies [IRSA and Cresud],” according to the Times, though Elsztain eventually severed his business ties with Soros in 2000 and took complete control of the now-massive business empire. Yet, this empire of Elsztain’s had been built with much more than help from Soros. Indeed, other key shareholders of IRSA who helped finance the acquisition of Cresud, BrasilAgro and other key holdings of Elsztain’s were three North American billionaires all known for their Zionist activism: Sam Zell, American real estate magnate; Michael Steinhardt, legendary hedge fund manager and chairman of Genie Energy’s Strategic Advisory Board; and Edgar Bronfman, whose fortune was made by the Seagram distilleries and Universal Studios, among others. Bronfman — former president of the World Jewish Congress, who was known for his closeness to the Clintons — had known Elsztain long before, as the two had previously met in Israel. In addition to the help provided by powerful billionaires, the growth of Elsztain’s empire was notably aided by the government of Argentina on my occasions, not only during Menem’s presidency but also under the presidencies of Nestor Kirchner, his wife and successor Cristina Fernández de Kirchner, and — more recently — Mauricio Marci. One clear example of this government-furnished aid is the fact that Argentina’s Social Security Administration (ANSES), which funds the majority of Argentina’s recently gutted social programs, is heavily invested in and has been used to buy shares of a raft of Elsztain and Mindlin-owned companies, including IRSA, Cresud, Alto Palmero SA, Pampa Energia, Edenor and Petrobras Argentina. In at least two cases, ANSES has been used by both Elsztain and Mindlin to fraudulently acquire companies and expand their business empires. In 2012, Elsztain made a gamble to begin building a new business empire, not in Argentina but in Israel. His leap into Israel’s market took many by surprise, not for his decision to invest in the country, but where and with whom he had decided to invest. That September, news broke that Elsztain had offered embattled Israeli businessman Nochi Dankner $25 million to keep the latter’s sprawling business empire — IDB, Israel’s largest holding company — afloat. Not only that, but he promised to infuse an additional $75 million in the near future, to the shock of Israel’s financial sector and even IDB shareholders, who had increasingly lost faith in Dankner. Elsztain’s reasons for investing so heavily and seemingly out of nowhere to prop up a controversial Israeli tycoon and prop up IDB led to considerable speculation in Israeli media. Notably, Haaretz asserted that it was likely linked to Elsztain’s long-standing “Zionist activism” as well as a “religious-spiritual element” stemming from his closeness to the New York-based Chabad movement. Indeed, Elsztain had been introduced to Dankner by Chabad Rabbi Yoshiyahu Pinto, whose father-in-law, Shlomo Ben Hamo, is the chief rabbi of Argentina. Pinto has been an important figure in past investments of Elsztain and his role — as well as those of other Chabad rabbis in Elsztain’s business activities, including the unscrupulous — will be discussed in a subsequent article in this series. Elsztain’s promise of investing $75 million more in Dankner’s Ganden Holdings, through which he owned IDB, had fallen flat by July 2013, a decision Elsztain had made just a matter of days after becoming IDB’s deputy chairman. Though Elsztain backtracked on his plans to help Dankner maintain his hold on the company, Elsztain had no plans to abandon his ultimate goal of influence over IDB’s business empire and joined forces with a relatively unknown Israeli businessman, Moti Ben-Moshe. By the end of the year, and with help from the Israeli court system, Elsztain and Ben-Moshe had wrested control of the massive holding company from Dankner and become its new owners. Then, just two years later, Elsztain ousted Ben-Moshe and became the sole controlling shareholder of the megacompany. Elsztain’s total investment in IDB through IRSA and IRSA affiliates is now believed to surpass $420 million. IDB is one of Israel’s largest companies and among its holdings are Israel’s largest chain of supermarkets, Shufersal (sometimes written as Super-sol); the cornerstone of the Israeli tech industry and parent company of Elbit weapon systems, Elron Electronics; Israel’s fourth largest airline, Israir; Israeli kosher dairy giant Mehadrin; and one of Israel’s largest internet providers, CellCom; among others. Soon after Elsztain acquired control over IDB, prominent Elsztain allies took top positions at IDB subsidiaries. For instance, Matthew Bronfman — who is in business with the Rothschilds and is the son of Elsztain ally and associate Edgar Bronfman — became a top shareholder in Shufersal, while Saúl Zang — Elsztain’s longtime lawyer and an IRSA executive — became vice chairman of Elron Electronics. Elsztain’s sister Diana, who has long lived in Israel, was also placed on IDB’s board. Another person placed on the IDB board by Elsztain is Giora Inbar, who used to chair TAT technologies, an Israeli company with U.S. subsidiaries whose clients include Boeing, Lockheed Martin and the U.S. Army. In addition, Benjamin Gantz — presidential candidate in upcoming Israeli elections and former IDF chief of staff during the 2014 war with Gaza, was on the board of directors of Elron Electronics, whose chairman is Elsztain, until just this past week. Aside from IDB, Elsztain has also — through a separate company, Dolphin Netherlands BV — increased his holdings in several other Israeli companies. These include Nova Measuring Instruments — which focuses on artificial intelligence, big data and is a key company in global circuit manufacturing — as well as Paz Oil, Israel’s largest oil and gas company. Another Israeli company in which Elsztain has sizable holdings is Magic Software, which now plays a key role in Argentine elections and will be treated in detail in a subsequent section of this article. Though his massive Israel-based business empire is beginning to rival his Argentine empire in size and influence, Elsztain has shown in recent years that he desires to continue expanding his business interests in the Zionist state. Last January, news broke that Elsztain sought to acquire Bezeq, Israel’s largest telecommunications company, after its owner Eurocom, controlled by Israeli businessman Shaul Elovitch, was “pressured” to give up the company by some of Israel’s largest banks, including Israel Discount Bank. Notably, the controlling stake of Israeli Discount Bank is owned by Matthew Bronfman, who is also a main stakeholder in IDB company Shufersal and whose father was a close associate of Elsztain in IRSA and at the World Jewish Congress, where Matthew Bronfman has also held prominent roles. Despite his friends in high places, Elsztain has encountered difficulty after difficulty in his efforts to acquire Bezeq as a result of Israel’s anti-centralization laws — laws that ironically had helped him take control of IDB from its previous owner. Elsztain has tried to sell off IDB’s CellCom subsidiary — Bezeq’s main rival — in order to acquire Bezeq, but without success. He has since turned his efforts to buying Eurocom’s subsidiaries piece by piece, starting with Spacecom, an Israeli satellite operator. It remains to be seen if Bezeq’s recent financial difficulties have given Elsztain cold feet or are part of a behind-the-scenes effort to weaken and then acquire the company. Given his history, both are equally plausible. Elsztain’s ties to and influence in Israel will become increasingly important in subsequent installments of this series, as Israel’s government, as well as prominent elements of the Zionist lobby to which Elsztain is connected, have been and are involved in past and current efforts to force Argentina’s governments to relinquish Patagonia. Indeed, Elsztain and his associates are often the avenue through which international oligarchs insert themselves into Argentina’s economy and politics, first for Soros and now for much more powerful figures. The Council of the Americas (COA) was originally founded in 1963 by David Rockefeller as the Business Group for Latin America, which two years later became known as the Council for Latin America and then the Center for Inter-American Relations before undergoing a final name change. From its founding to its current state, the COA has been the voice of the multinational corporations (and the oligarchs behind them) that represent the vast majority of U.S.-based private investment in Latin America. The organization is often described as the Latin American equivalent of the Council on Foreign Relations (CFR), which was chaired by David Rockefeller for several decades and has long been heavily funded by the Rockefeller Foundation. David Rockefeller founded the COA while serving as CFR chairman. Rockefeller was the COA chairman from 1981 to 1992 and was honorary chairman until his death in 2017. The vast majority of the directors on COA’s board are executives of Latin American operations of major European and U.S. multinational corporations such as Shell Oil, JP Morgan, PepsiCo, Chevron, Boeing, Citigroup and Microsoft. One of the group’s chairmen after Rockefeller was John Negroponte, who was involved in the Reagan era cover-up of U.S. support for Latin American death squads and was deeply involved in the creation of the North American Free Trade Agreement (NAFTA), which was the “brainchild” of COA. Negroponte also served as U.S. ambassador to Iraq and later deputy secretary of state under George W. Bush and was the first Director of National Intelligence (DNI). Negroponte is currently COA chairman emeritus and on its board of directors. The current COA chairman is Andrés Gulski, a former IMF official and Santander bank executive who is currently CEO and President of AES power company, which — alongside Mindlin and Lewis’ Pampa Energia — is one of the top electricity producers in Argentina. Gulski also served in Venezuela’s ministry of finance in the U.S.-backed, pre-Chávez government and more recently was on Barack Obama’s Export Council. COA’s current president and CEO is Susan Segal, a former JP Morgan executive who “was actively involved in the Latin American debt crisis of the 1980s and early 1990s, sitting on many Advisory Committees as well as serving as chairperson for the Chilean and Philippine Advisory Committees” while the former country was ruled by a brutal, U.S.-backed military dictatorship. She also received an award from Colombia’s then-President Alvaro Uribe, who once led Colombia’s right-wing narco-death squads. While COA has long been formed and funded by Western multinational corporations, among the handful of Latin American-based companies that are both “elite” members and sponsors of the organization are IRSA and Pampa Energia. Other prominent COA sponsors include Citigroup, JP Morgan, and Soros’ Open Society Foundations. Elsztain and Mindlin are also both members of COA and are regular speakers at the annual Argentina Investment Conference that COA jointly hosts with Blackrock, the world’s largest investment management corporation. Mindlin and Elsztain also serve on COA’s International Advisory Council. Membership is by invitation only. The G50 was founded in 1993 by Moses Naím, former director of Venezuela’s Central Bank and Venezuela’s minister of trade and industry in the 1990s, as well as former executive director of the World Bank. Naím, who still chairs G50, is also on the board of directors of Soros’ Open Society Foundations. G50 was originally founded with funding from the Carnegie Endowment for International Peace, which itself is funded by the Rockefeller Brothers Fund, the Open Society Foundations, and the U.S. and U.K. governments, among others. Naím is also on the board of directors of AES, whose president and CEO is also current COA Chairman Andrés Gulski. While Elsztain and Mindlin are both well-connected to both George Soros and the Rockefeller-founded Council of Americas, Elsztain, for his part, shares ties with other well-known families of oligarchs: the Rothschilds and the Bronfmans. Elsztain’s close ties with the Bronfmans and the Rothschilds have largely manifested through his prominent positions at the global Zionist lobby organization, the World Jewish Congress (WJC), whose long-time president from 1981 to 2007 was Edgar Bronfman, the Seagram billionaire who was also a close friend of Elsztain and himself a key shareholder in Elsztain’s IRSA. Elsztain served previously as treasurer and chairman and is currently a vice president of the WJC and chair of the WJC business council. The WJC is currently chaired by David de Rothschild. In addition to his connections to the Bronfmans through IRSA and WJC, Elsztain also serves on the board of Endeavor Argentina — the Argentine branch of Endeavor Global, whose chairman is Edgar Bronfman Jr. The role of the Rothschilds, Bronfmans and WJC in the events currently unfolding in Argentina — as well as the roles of other pertinent elements of the global Zionist lobby — will be explored in detail in a subsequent installment of this series. However, it is worth pointing out that the fortunes of the Rothschilds have become increasingly intertwined with those of the Rockefellers — particularly after RIT Capital Partners bought 37 percent of Rockefeller Financial Services in 2012 — as well as those of the Bronfmans, after the 2013 creation of Bronfman E.M. Rothschild E.L. LLC. As the influence of Elsztain, Mindlin and their associates has expanded in Argentina as well as in Israel, this small, close-knit group of powerful billionaires has now set its sights on consolidating political power in Argentina for themselves and their even more powerful backers. Though the presidency of Macri has seen their influence grow in new and troubling ways, new evidence shows that Elsztain, with the backing of the Rothschild banking family, has set his sights on Argentina’s voting system. For the past few years, Macri’s government has been heavily promoting the need for electronic voting systems in Argentina, which it argues are needed to modernize the country’s current paper-ballot system. However — as has been seen in other countries, including the U.S., where such systems have been implemented — the results of elections run on electronic voting systems can be easily manipulated and such manipulations are effectively impossible to detect. They’re often rushed into use with great promises of speed, convenience, and accuracy, but these fully computerized voting systems — particularly those that provide no paper record of votes cast — have turned out to be problematic, to say the least, everywhere they have turned up, including the U.S. and several European countries. In fact the trend now is to ditch them in favor of return to paper-based systems. Ireland literally turned its voting computers into landfill; Norway, Germany, The Netherlands, and gradually the U.S. have all taken them out of service. If I wanted to take over a country — stay in power despite doing things that would surely get me voted out — I could stage a coup and roll tanks down the streets of the capital. Or I could install an electronic voting system — as Macri is trying to do in Argentina and as the right wing managed to do in 2002 in the U.S. — and achieve the same result without firing a shot, without provoking outrage or resistance, and without altering people’s perception that they lived in a democracy. Concerns about manipulation only increase when the manufacturers and programmers of those voting systems have troubling connections to oligarchs or foreign governments. Unfortunately for Argentina, the electronic voting machines being promoted by Macri have many such troubling connections. Since his 2015 presidential campaign, Macri has pushed for the implementation of electronic voting nationwide, calling it necessary for creating “a more transparent voting system.” By 2017, Macri’s “comprehensive” voting reform legislation, which called for electronic voting nationwide, was passed by Argentina’s Congress — only to remain essentially frozen in its implementation, as holdovers from the previous administration in the government’s bureaucracy have worked to block the nationwide shift to digitized voting. Notably, a recent poll conducted in Argentina found that 60% of respondents would never consider voting for Macri in future elections. Though the voting systems were not implemented nationwide, they are already being used in many areas of Argentina, including the city of Buenos Aires (population 2.89 million) and the provinces of Salta (1.2 million), Córdoba (3.3 million), Chaco (1 million), Tucumán (1.4 million), Santa Fe (3.2 million), and the Patagonian province of Neuquén (0.5 million). As a consequence, despite the lack of a nationwide system, more than 25 percent of Argentina’s population already votes using electronic machines, all of which are incidentally manufactured by a single company, Magic Software Argentina (MSA). Concerns over MSA were voiced early-on in Argentine media, such as a report published in Letra P that noted that MSA had developed a close relationship with members of Macri’s inner circle and his political party in prior years, suggesting a conflict of interest. In addition, just last week, a man attempting to use an electronic voting machine in the Nequén province filmed how the MSA-made voting machine printed out a result that was entirely different from the one he had chosen, prompting him to ask to vote again for his chosen candidate, a request that was initially denied. After the incident, several machines were found to be working improperly. Though such reports are troubling, they barely scratch the surface of MSA and the more likely and troubling reasons why this company was given control over the democratic processes in many Argentine provinces and, if Macri gets his way, the entire country. Magic Software Argentina was created in 1995 by Sergio Osvaldo Orlando Angelini and Alejandro Poznansky and, as noted by the Argentine outlet El Disenso, specializes in “importing, adapting and commercializing informatic systems in Argentina as well as representing and being the national face of foreign business like Magic Software Enterprises,” MSA’s parent company. Magic Software Enterprises (MSE) was originally known as Mashov Software Export and is an Israeli software company headquartered in Or Yehuda. In 1991, the company changed its name and became the first Israeli software company to be listed on the Nasdaq. MSE has long had a close relationship with Israel’s military, the Israel Defense Forces (IDF), which was reaffirmed in 2010 when MSE was tasked with upgrading software systems for the IDF and Israel’s military police. While concerns about undue influence or meddling by either the U.S. and/or Israel are valid, an examination of the power behind MSA and its parent company MSE reveals something much more troubling, as well as just how influential Eduardo Elsztain has become. MSE’s largest shareholders are IDB Development Corp Ltd and Clal Insurance Enterprises Holdings Ltd., and smaller shareholders include the Rothschild banking family through the firm Edmond de Rothschild Holdings. As previously mentioned, IDB Development Corp was acquired by Eduardo Elsztain in 2015. In addition, a majority stake in Clal Insurance Enterprises — MSE’s second largest shareholder — is owned by Dolphin Netherlands B.V., which incidentally is a subsidiary of IRSA, and Elsztain is chairman of its board. In other words, the most powerful and influential shareholder in both Magic Software Enterprises, and its Argentine subsidiary Magic Software Argentina, is none other than Eduardo Elsztain. In summary, through political connections, corruption and white-collar crime, this network of billionaires — the most visible of whom is Eduardo Elsztain — has essentially taken control of not only the bulk of Argentina’s resources — its electricity, its land, its agriculture, its water, its financial system — but also its voting system. Yet, far from being purely an effort of powerful Argentine billionaires like Elsztain and Mindlin, control over Argentina’s economy, government, industry and land has long been a goal of powerful oligarchs dating back at least 70 years. Those very figures successfully engineered Argentina’s economic collapse in the early 2000s and then — through intermediaries close to Henry Kissinger, the IMF and the world’s largest banks — greatly pressured its government to relinquish Patagonia in exchange for “debt relief” from the economic chaos they had created. The next installment of this investigative series will focus on Marcelo Mindlin and the interests of the Mindlin-Elsztain network in oil and gas in Argentina’s Patagonia, as well as in the contested Falkland Islands.